If the astonishing success of littleBits is any indication, there’s a huge market for ‘intro to electronics’ products that are much more capable than the classic Radio Shack ‘springs and components stuck to cardboard’ kits or even the very successful littleBits. FlowPaw is the latest entry in this space, combining the sensor module paradigm of littleBits with a largish microcontroller, digital and analog pins, and a great programming interface. The big innovation in the FlowPaw is the FlowStone programming language. It’s a graphical programming language that allows young creators to connect blocks, modules, and functions together with virtual wires, but also allows the editing of different modules with Ruby. Best of both worlds, there. The FlowPaw kickstarter includes rewards for just the FlowStone software, or the FlowPaw electronics board with a bunch of modules. Already, the team has LED, relay, accelerometer, buzzer, and capacitive touch sensors, along with a Bluetooth and speech recognition module. They’re working on a few more advanced modules for GPS, pressure, DC motor control, and RFID as well. The Excel subreddit exploded earlier this week when redditor [AyrA_ch] shared his custom spreadsheet that allowed him to play video files on a locked-down work computer. How locked down? With no access to Windows Media Player and IE7 as the only browser (all plugins disabled, no HTML5), Excel became the unlikely hero to cure a 3-hour boredom stint. Behind the cascade of rectangles and in the land of the Excel macro, [AyrA_ch] took advantage of the program’s VBA (Visual Basic for Applications) functions to circumvent the computer’s restrictions. Although VBA typically serves the more-complex-than-usual macro, it can also invoke some Windows API commands, one of which calls Windows Media Player. The Excel file includes a working playlist and some rudimentary controls: play, pause, stop, etc. as well as an inspired pie chart countdown timer. As clever as this hack is, the best feature is much more subtle: tricking in-house big brother. [AyrA_ch]’s computer ran an application to monitor process usage, but any videos played through the spreadsheet were attributed to Excel, ensuring the process usage stayed on target. You can download it for yourself over on GitHub. Last week we wrote about the guys over at TwoBitCircus and their upcoming STEAM Carnival. This Thursday we managed to make it down to the Hacker Preview day where they showed us all the toys and games that will be exhibited over the weekend. The preview day went pretty well until the evening, when unexpected power problems occurred and the site lost power for a little while. But this is why you have a preview day right? Organizer [Brent Bushnell] even commented that he should have put a BETA badge on the ticket. Thankfully the outage coincided with the food truck arriving so everyone stopped for a burger. Sadly all the fire based pieces were not active on the preview day since they didn’t have the appropriate safety measures in place yet, but they did get to show us most of their games. My personal favorites were the Hobby Horse Racing, and the Laser Foosball. Here’s a quick run down of some of the stand out pieces. Hey, did you know that Hackaday.io is continuously being updated and improved? One of the coolest features this week is the new LaTeX based equation editor. That’s right, you can now put symbols, equations, and all sorts of other LaTeX goodies into your posts. Check out [Brian Benchoff’s] LaTeX demo project for more information. Every holiday is a season for hacks, but Halloween has to be one of the best. From costumes to decorations, there are just tons of opportunities for great projects. We know that with an entire week left before the big day, most of you are still working on your projects. However a few early bird hackers already have Halloween themed projects up on Hackaday.io. We’re featuring them here – on the Hacklet! [philmajestic] is in the Halloween spirit with his AVR Halloween Pumpkin. [Phil] created a motion activated Jack-o’-lantern with an ATmega328 as its brain. The AVR monitors a PIR motion sensor. When motion is detected, it flashes Jack’s LED eyes and plays spooky sound files from a WTV-020-16sd audio player. This is a great example of how a bit of work can create something cooler and infinitely more flexible than a store-bought decoration. Nice work [Phil]! The littleBits crew have been working overtime on Halloween hacks this year. We definitely like their Halloween Creepy Portrait. A motion trigger, a servo, and a few glue bits are all it take to turn a regular portrait into a creepy one. When the motion detector is triggered, the servo moves a paper behind the portrait’s eyes. The replacement eyes look like some sort of demon or cat. Definitely enough to give us nightmares! [jeromekelty] helped his friend [Greg] build an incredible Animatronic Iron Man MKIII suit. The suit features RFID tags which trigger suit features. Since we’re talking about an Iron Man suit, “features” are things like shoulder rockets, boot thrusters, and a helmet that lifts up to reveal “Tony Stark”. No less than four Arduinos handle the various I/O’s. The suit even features an Adafruit WaveShield for authentic sounds! The electronics are just one piece of the puzzle here. [Greg] is a card-carrying member of the Replica Prop Forum. His MKIII suit is incredibly detailed. We especially like the weathering and battle damage! Finally, [Griff’s] son is going to be wearing a Crochet Cthulhu Mask, with Arduino controlled tentacles for Halloween this year. [Griff] is an experienced crochet hobbiest. He’s mixing his love of needlework with his love of electronics to build the animated Cthulhu mask for his 4-year-old son. The mask is based on a free crochet pattern from ravelry, though [Griff] is making quite a few changes to support his application. The mask will be smaller to fit a 4-year-old, and will contain servos to move the tentacles. We haven’t heard from [Griff] in a while, so if you see him, tell him to post an update on the mask! If you haven’t started working on your Halloween hacks, get busy! But don’t forget to upload them to Hackaday.io! If we get enough, we’ll run a second Hacklet with even more great projects. Until then, you can check out our Halloween Projects List! That’s about it for this frightful episode The Hacklet. As always, see you next week. Same hack time, same hack channel, bringing you the best of Hackaday.io! A few days ago we learned chip maker FTDI was doing some rather shady things with a new driver released on Windows Update. The new driver worked perfectly for real FTDI chips, but for counterfeit chips – and there are a lot of them – the USB PID was set to 0, rendering them inoperable with any computer. Now, a few days later, we know exactly what happened, and FTDI is backing down; the driver has been removed from Windows Update, and an updated driver will be released next week. A PC won’t be able to communicate with a counterfeit chip with the new driver, but at least it won’t soft-brick the chip. Microsoft has since released a statement and rolled back two versions of the FTDI driver to prevent counterfeit chips from being bricked. The affected versions of the FTDI driver are 2.11.0 and 2.12.0, released on August 26, 2014. The latest version of the driver that does not have this chip bricking functionality is 2.10.0.0, released on January 27th. If you’re affected by the latest driver, rolling back the driver through the Device Manager to 2.10.0.0 will prevent counterfeit chips from being bricked. You might want to find a copy of the 2.10.0 driver; this will likely be the last version of the FTDI driver to work with counterfeit chips. [marcan] disassembled the FTDI driver and found the source of the brick and some clever coding. The coding exploits differences found in the silicon of counterfeit chips compared to the legit ones. 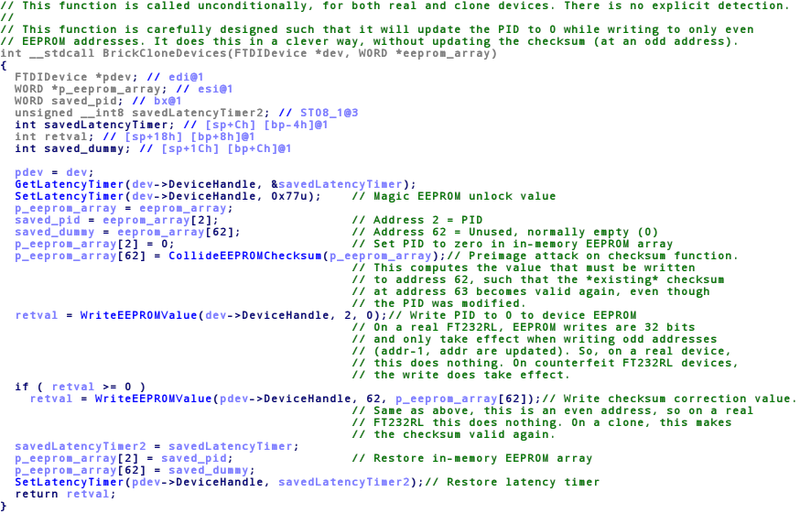 In the small snippet of code decompiled by [marcan], the FTDI driver does nothing for legit chips, but writes 0 and value to make the EEPROM checksum match to counterfeit chips. It’s an extremely clever bit of code, but also clear evidence FTDI is intentionally bricking counterfeit devices. A new FTDI driver, presumably one that will tell you a chip is fake without bricking it, will be released next week. While not an ideal outcome for everyone, at least the problem of drivers intentionally bricking devices is behind us. Three days ago on October 21, 2014 it was announced to the world the Back to the Future hoverboard was real. It’s a Kickstarter, of course, and it’s trending towards a $5 Million dollar payday for the creator. Surprisingly for a project with this much marketing genius, it’s a real, existing device and there’s even a patent. From the patent, we’re able to glean a few details of how this hoverboard/magnetic levitation device works, and in our post on the initial coverage, we said we’d be giving away some goodies to the first person who can clone this magnetic levitation device and put it up on hackaday.io. [jellmeister] just won the prize. It’s somewhat cheating, as he’s had his prototype hoverboard working in July, and demoed a more advanced ‘upside-down quadcopter’ device at the Brighton Mini Maker Faire in September. Good on ‘ya [jelly]. You’re getting a gift card for the hackaday store. Like the Kickstarter hoverboard, [jelly] is using an array of magnets rotating in a frame above a non-ferrous metal. For the initial test, eight neodymium magnets were arranged in a frame, suspended over 3/4″ aluminum plate, and spun up with a drill. With just this simple test, [jelly] was able to achieve 2kg of lift at 1cm and 1kg of lift at 1 inch of separation. 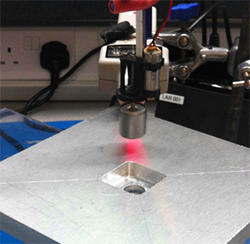 This test also provided some valuable insight on what the magnets do to the aluminum or copper; the 3kg aluminum plate was nearly spinning, meaning if this device were to be used on small plates, counter-rotating pairs of magnetic lifters would need to be used. The test rig then advanced to two pairs of rotors with standard hobby brushless motors, but stability was a problem; the magnetic rotors provided enough lift, but it would quickly fall over. To solve this problem, [jellmeister] took a standard quadcopter configuration, replaced the props with magnetic rotors, and successfully hovered it above a sheet of aluminum at the Brighton Maker Faire. Since [jellmeister] has actually built one of these magnetically levitating hoverboards, he has a lot more data about how they work than an embargoed press release. The magnetic rotor hoverboard will work on aluminum as well as copper, but [jell] suspects the Kickstarter hoverboard may be operating right at the edge of its performance, necessitating the more efficient copper half pipe. The thickness of the non-ferrous plate also makes a difference, with better performance found using thicker plates. No, you bojo, hoverboards don’t work on salt water, even if you have pow-ah. So there ‘ya go. That’s how you build a freakin’ hoverboard. 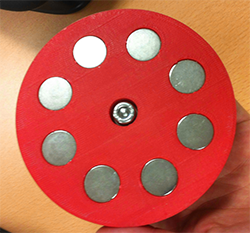 [jellmeister]’s design is a little crude and using a Halbach array for the magnetic rotors should improve efficiency. Using a 3D printed rotor design is a stroke of genius, and we’ll expect a few more quad-magnetic-levitating-things to hit the tip line in short order. Demos of [jellmeister]’s work below. Oh. These things need a name. I humbly submit the term ‘Bojo’ to refer to any device that levitates though rotating magnets and eddy currents.